Emory University, in partnership with The Dalai Lama Trust and the Vana Foundation of India, will host the launch of Emory’s international SEE Learning (Social, Emotional and Ethical Learning) program in New Delhi, India, April 4-6. Emory Presidential Distinguished Professor, His Holiness the XIV Dalai Lama, will preside over the program that will feature national and international experts and an invited audience of more than 1000 educational and policy leaders from around the world. The event will include children’s rights activist and Nobel Peace laureate Kailash Satyarthi, along with globally recognized experts in social and emotional learning Daniel Goleman, Linda Lantieri, Robert Roeser, and Kimberly Schonert-Reichl. SEE Learning provides educators with a comprehensive framework for the cultivation of social, emotional and ethical competencies that can be used in K–12 education as well as higher education and professional education. The program is part of Emory’s newly established Center for Contemplative Science and Compassion-Based Ethics. 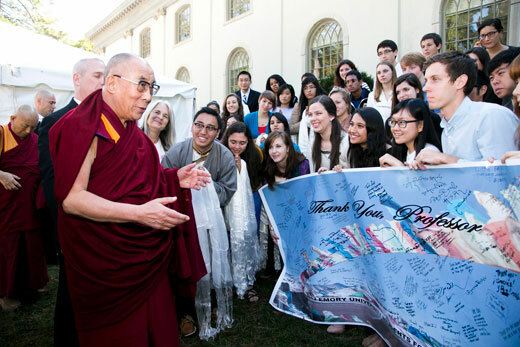 Formerly known as the Emory-Tibet Partnership, a program within the Emory College of Arts and Sciences (ECAS), the center was established as a result of a total gift of $11 million from Yeshe Khorlo Foundation and from the Gaden Phodrang Foundation of the Dalai Lama. In addition, the Pierre and Pamela Omidyar Fund donated $2.2 million dollars in operational funding for 2019-20 with a commitment to continue funding for two additional years. Negi and his colleagues collaborated with internationally recognized experts in developmental psychology, education, neuroscience and trauma-informed care in developing the program. “There is a growing awareness of the effects of stress on young people and the need to incorporate social, emotional and ethical learning into standard K-12 academic curricula to address the needs of the whole child,” says Negi. This innovative program, known as SEE Learning (Social, Emotional and Ethical Learning), includes important new topics such as attention training, the cultivation of compassion for self and others, resilience skills based on trauma-informed care, systems thinking and ethical discernment. Initiated as a pilot program in 2015, SEE Learning has met with interest in the United States and worldwide, with partnerships to date in North and South America, South Asia, East Asia and Europe. More than 600 educators in various countries have attended SEE Learning workshops, many of them providing ongoing feedback in evaluating, enhancing and refining the pedagogical framework for the program and contributing to the development of curricula designed for early elementary, late elementary and middle schools. A high school curriculum is planned for 2020. Following the global launch, an online platform will be available for educator preparation, and the curriculum is currently being translated into fourteen languages. With a vision of “a compassionate and ethical world for all,” the center supports a research-based approach to educating both heart and mind. Programs are grounded in a theoretical framework for the cultivation of competencies that lead to the prosocial behaviors and outcomes that support flourishing and well-being for individuals and societies. The center also works to demonstrate the efficacy of these programs through innovative research. In addition to SEE Learning, the center houses two signature programs: CBCT (Cognitively-Based Compassion Training) and the Robert A. Paul Emory-Tibet Science Initiative (ETSI). CBCT is a secularized and systematic approach to cultivating compassion that draws from the Indo-Tibetan lojong or “mind training” tradition. ETSI is a long-term project integrating a comprehensive modern science curriculum into Tibetan monastic education. Emory University, led by President Claire E. Sterk, is a top-ranked private research university recognized internationally for its outstanding liberal arts colleges, graduate and professional schools, and one of the world’s leading healthcare systems, located on a beautiful campus in Atlanta, Georgia. Emory is enriched by collaboration among its two liberal arts colleges, graduate school, and professional schools of medicine, theology, law, nursing, public health and business, centers and partners, as well as by the legacy and energy of Atlanta. Through collaboration among its schools, units, and centers, as well as with affiliated institutions such as The Carter Center and the U.S. Centers for Disease Control and Prevention, Emory is committed to working for positive transformation in the world.